It might be perplexing to budding wine enthusiasts and no doubt connoisseurs will be aghast at the very notion of enjoying a beer at the end of a wine dinner, however the ‘cleansing ale’ does have its merits. When I was a young sommelier, one of the most high-level, serious wine dinners I ever served was the 50th birthday of revered wine author and critic, James Halliday, with a gathering of the secret wine society known as “The Single Bottle Club” and some of the biggest wine collectors and sophisticated palates in Australia. With a roll call of wines like 1937 Bollinger, 1938 Ch Haut-Brion Blanc, 1938 Ch Latour, 1937 Ch d’ Yquem 1918 Ch Rieussec, to mention a few and finishing with 1908 Vintage Port, I was somewhat baffled when the legendary wine raconteur and bon vivant, the late Len Evan’s, approached me and bellowed, “MARSH!”, “where is the bloody cleansing ales man! Call yourself a sommelier; we’re all dying of thirst here!” To which I scrambled with much haste to disperse several Heinekens. It was one of those invaluable lessons in wine service and wine industry idiosyncrasies that one never forgets and forever after, I have always made sure there is a beer of choice on hand. Thus, when Blair Walter, winemaker at Felton Road, Central Otago, New Zealand (www.feltonroad.com) was in town last week and we rallied for a casual dinner at Praelum Wine Bistro (http://praelum.com.sg/) with some of Singapore’s top Sommelier’s. When Walter asked me what should he bring with him I replied, “Beer” and I wasn’t joking. Having introduced me to Three Boys Brewery www.threeboysbrewery.co.nz Walter new exactly where I was coming from and he packed some IPA and Pilsner along with some Felton Road back-vintages to liberate with our sommeliers. 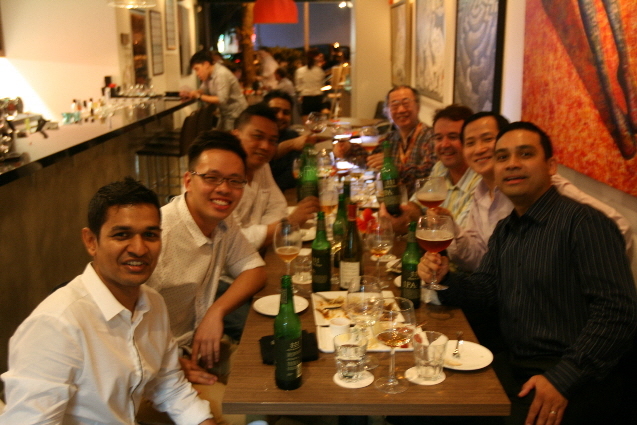 As you can see by the picture, our Singapore sommeliers had no problem grasping the concept of “the cleansing ale”, or two! I would however like to point out that Three Boys is no ordinary brewery or micro-brewery to be precise, making a brilliant IPA, Indian Pale Ale that is, a style of beer that was born when fresh hops were added to barrels to preserve beer quality when shipping from England to colonial India. It is this bitterness and the savoury flavour of hops that makes Three Boys IPA the perfect after dinner “cleansing ale”. Of course you don’t have to wait until after dinner to drink IPA! The IPA being my preference for evening/dinner consumption, I would drink the Pils more as a thirst quencher, as they do at Felton Road during vintage. Actually, you’d be surprised how much beer drives the wine industry. But above all, Three Boys beers are not filtered or pasteurised – they are small batch, artisan natural beers that are a living product – that is, real beer and not to be confused with commercial bilge water beer that is prevalent in bars and restaurants and the masses are corralled and suckered into funding their advertising campaigns. And a big pat on the back for our sommelier/manager at Praelum Wine Bistro, Gerald Lu, doing a stirling job of building the wine culture in Singapore – Bravo!